Remember Bramasole, the charming Italian villa Diane Lane buys on a whim in the movie Under the Tuscan Sun? 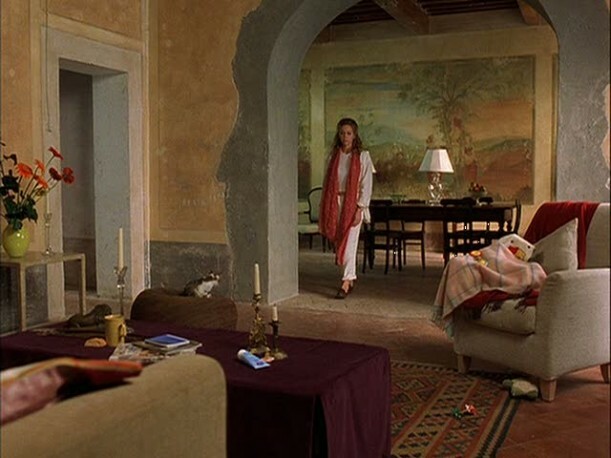 It was filmed on location in Tuscany in Villa Laura, a house they didn’t actually remodel for the shoot. Instead, they “just cleaned it up a little and filmed it in warmer, prettier light,” according to writer-director Audrey Wells. The real restoration work on the real house began in 2006. Let’s see how it looks today! Note: There are affiliate links in this post that may earn me commission without changing the price. There are actually two buildings on the property. You can rent the villa the next time you’re in Tuscany. There’s plenty of room for everyone here, with 10 bedrooms and 10.5 baths. 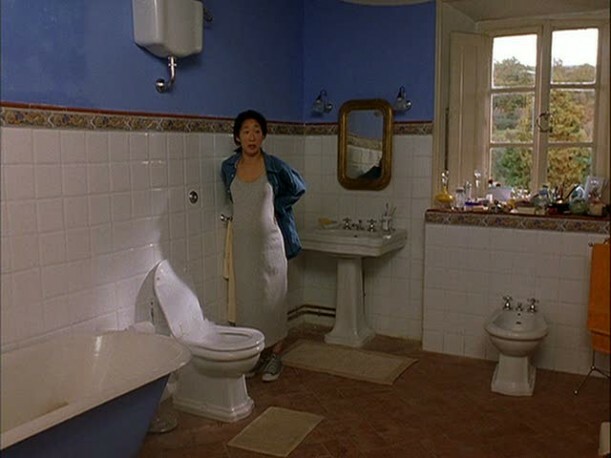 Again, the bathroom in the movie was much more basic than they are now! Sounds like the perfect vacation to me! You can see my original post with more photos from the movie here. *Update: you can also see my more recent post about this villa here. Have a wonderful day, Julia. Wow – I love the renovation! LOVE the choice they made for the ceilings! I don’t remember if I saw that movie — better check it out again! Thanks for the update. I must say though that the book is way better than to movie. (Sorry, I couldn’t help myself). A swim in the travertine pool and a soak in the jacuzzi sound great, but that house is so gorgeous I could just wander around it all day. Okay, well maybe not all day, but it’s lovely. I love that movie! I just watched it again last week and was thinking “I wonder if Hooked on Houses has ever posted about this house. Glad you re-posted today! Thank you! Bramble is perfection. A gorgeous villa I would love to stay in. The last 2 times we were in Cortona I kept asking my husband if we had time to go looking for Bramasole 🙂 He has yet to oblige. Once we were there shortly after the book was released and it was in every shop window. The novelty of it seems to have worn off though because there were way fewer displaying it last visit. Julia – you should make a trip there sometime. I can recommend a slightly smaller but perfect villa not far in Lucignano that is truly paradise found. 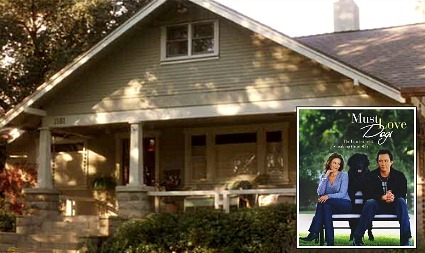 That’s neat to see the pics of the house where the movie was shot and what they did with the renovations. But it’s a shame that all of the hsitoric character of the home was gutted out. 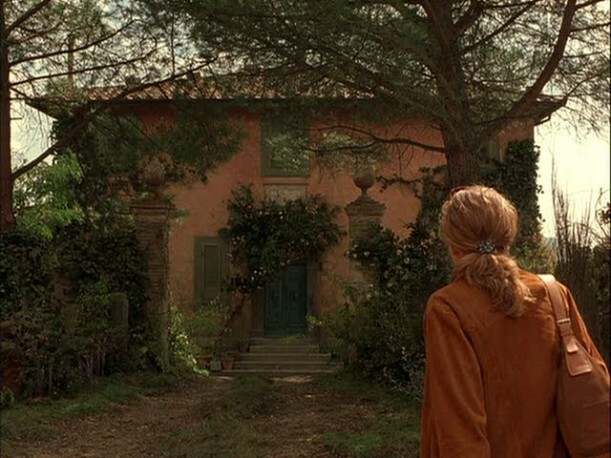 Frances Mayes real house in Tuscany (not the one shown in the movie) still retains a lot of the historic Tuscan charm. Thank you. I hate the remodel. It looks so contemporary, so neutral, so like it could be any new house anywhere in the world. Loved it in the movie before it was “fixed”. yay! you did the post! I feel a little bit famous today. I was so excited when I found this and sent it to you. Now let’s see if 10 of your readers rented it at the same time and split the daily 2,500€ charge….maybe more affordable? Even still expensive! I am a little confused now. I love Francis Mays and I’ve read her books. From what i was understanding Bramasole was her personal residence. I had no idea you could rent it. Guess i should go finish reading Every Day in Tuscany, Seasons of an Italian Life maybe she talks about it. Don’t get me wrong, I would be thrilled beyond belief to rent Bramasole!!! It would be a dream come true! Sorry for the confusion. This is the villa that they filmed the movie at. It was the movie version of Bramasole, not her personal one. I should have explained that better! 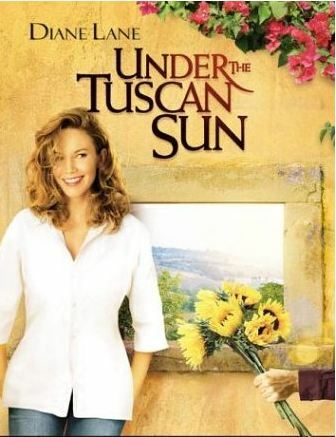 The Under the Tuscan Sun movie house is called Villa Laura. It’s below Cortona. Bramasole is still Bramasole and is our home. I am in love. This is stunning. Hardly what it was portrayed to be. Wi-Fi, who knew. I loved this post,thank you! I love watching movies for their architecture too :). This was a particularly good movie for it! Thanks for a the beautiful pics and good info- it takes me away on this cold Maine day. Ok, Julia, I’m officially impressed – the real Frances Mayes has dropped by. I’ve always wanted to visit Tuscany, even moreso now! Beautiful. But I love the more rustic movie version better. That movie was life changing for me. Drop the hubby! I’m in love with a house. Oh my gosh!! My favorite author posted a message!! Frances you made my day!! Thank You for explaining the difference in the homes. I dream of visiting Italy. I just love all these beautiful homes – makes me want to move. What a gorgeous house! This would make such a perfect vacation home, I never would want to leave. I don’t watch the award shows, but I always look forward to the red carpet galleries online. Holy cow girlie…she commented. How cool is that! Hi Julia how wonderful for you ….. she made contact. Thank you for sharing all this beauty hope one day soon you will be the one taking the pictures. Till next time Regards Esther from Sydney. What a way to start my Tuesday! Absolutely gorgeous– it’s going on my bucket list. I’m going over to Italian Villas now to see the price, just for fun. Hey, you never know. 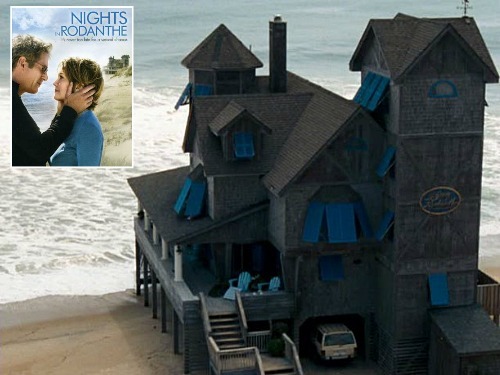 I like it but I prefer the rustic charm it had in the movie. Wow. Drool-worthy. But what happened to those beautiful murals in the original dining room? Were they original or added for the movie? – I suppose that would make a difference. While the renovated crisp white is soothing, modern, and clean, I have to admit to loving the original patina of the walls in those Pompeiian colors. With a movie set, though, it’s hard to know exactly how much was original. 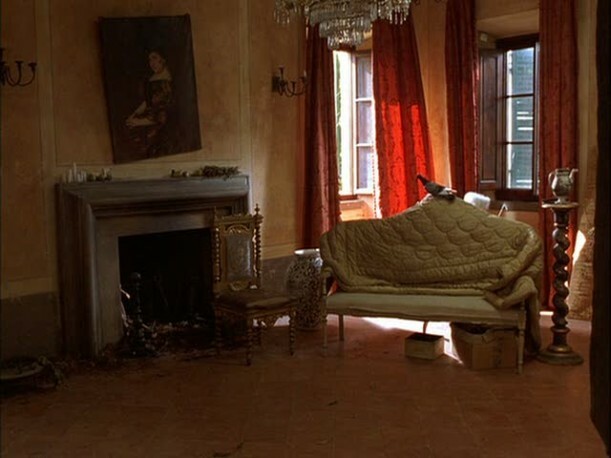 I wonder if there are pictures of the house interior before the set designers got to work? Now I’m off to look at Frances’ real Bramasole. I do have an autographed copy of the book. I have loved all of Frances Mayes’s books about her life in Tuscany and the movie stunk on so many levels. Hollywood couldn’t even get the house right! The real thing looks so much better. Oh my! I loved the movie and didn’t think I could love the house more but I actually do. They did an amazing renovation, love it! Wow! I hadn’t seen that. Thanks, Diane! Love the movie, love the house. What a dream vacation to rent it. Maybe someday when I win the lottery. Beautiful villa, but the more I liked in the movie. She had a soul. Hi everyone, I’ve read all the posts and thought I would clarify a few things! I’m so glad most of you seem to like it so much, I hope you come and visit us sometime 🙂 Thank you Julia for posting about us! Most of what you saw in the movie was just a set, hardly any of it was real I’m afraid. The frescos on the walls were all false as was the tap, the red colour of the house and the fountain in the square in cortona… We have put a false tap in though just for fun 🙂 We have renovated it extremely carefully over 5 years making sure all the original features are preserved and restored. Nothing was taken away and everything added is from reclamation yards in the area. All fabrics used are locally woven by Busatti of Anghiari, antiques from Arezzo and Cortona antique markets and travertine from the Florence area. The footprint of the house is exactly the same, what you didn’t see in the film was the farmhouse next door which is part of the property (see photos). As Francis says, her house is up the road Villa Laura was used as the set only. They are quite similar though with their balconies and similar build style! So nice to hear from you, Sophie! Thanks for stopping by and taking the time to explain more of these details for us. Your villa is beautiful! Its probably just me .., but, I hate the after . The kitchen seems ok ,but the original had such soul. The renovation looks like all my rich friends renovations ,who walk around with architectural digest under their arms and their decorators on speed dial. Im not saying its not a pleasant space or design but I feel its criminal to take a place with history and patina and turn it into antiseptic beige -could be anywhere- looks like a boutique hotel space….yuck. I’ve just come back to South Africa from Tuscany. Stunning how they manage to mix antiquity with modernity. I saw many, many abandoned houses which looked really quite livable. In South Africa, we make use of even the most delapidated housing. Over in Tuscany the scenery where a lot of these abandoned houses are situated, is breathtaking. Seems such a waste. I know there are reasons, just a pity. Funny though, how an abandoned Tuscan house manages to look romantic! This villa is absolutely stunning!!!! !